Cast: Akanishi Jin, Kitano Kii, Kora Kengo, Kasahara Hideyuki, Nobuaki Kaneko and Shibamoto Yuki. 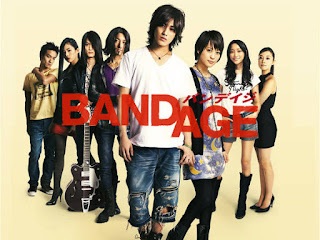 On the day, Suzuki Asako’s (Kitano Kii) best friend, Miharu (Anne), drops out of high school, she is given a CD of the band LANDS; Takasugi Natsu (Akanishi Jin) a easy-going lead singer, Yukiya (Kora Kengo) a quiet and mysterious guitarist, Ryuji (Nobuaki Kaneko) a loud drummer , Yamane Kenji (Kasahara Hideyuki) a fun and silly bassist and Suzuhata Arumi (Shibamoto Yuki) a bitchy and negative keyboardist, who haven’t really achieved success yet. Asako immediately falls in love with the band and their songs. Some time passes and the two girls meet again, this time they agree to go to a LANDS concert, where they sneak in backstage, and (litteraly) bump into Kenji. Asako loses her contact lens, and as Kenji is searching for it, Natsu walks by and becomes oddly interested in her. First things first: the music is so freaking well lyric’d!! Like, I don’t think that I’ve seen anything that has so many words AND can add up to be a good song. This movie is a “behind-the-scenes” movie, meaning the ACTUAL behind the scenes, and where it’s about music. In the middle of all that, a love story blossoms, and which cannot happened, since it’s affecting the band. For the first time (in my life) my heart didn’t flutter for Akanishi, mainly because his character was, well, humanised. When we see Johhny’s, we see handsome boys that never make mistakes or look bad. Takasugi Natsu is the COMPLETE opposite, he is awkward, silly, cowardly, and not to mention his lack of seeing hints. The fact that he acts as if the girl he likes, is his girlfriend, makes him also immature. To be honest it was very believable and the characters were original, so thumps up for that. First of all. I forgive u Bunji for watching it without me. I learned my lesson. I LIKED IT A LOT! I liked that it was so serious and Jin's acting skills,, WOW. Surprised. It was really cool i didnt expect Jin to be so.. COOL. Ive only watched Jin-san in Gokusen i think... And that was a comedy so for this movie it was so much different. It was a cool story and.. omg how many times did i write cool??. anyway the story is fun cause how many times in ur life do u get to not only meet a star but be invited to a 'party' later and then for him to start liking you... Duuuh,, like almost NEVER . And omg the music in the muvi is soooo serious. Like everything has to be perfect. And awww the song Jin-san writes ! ,, I dont knw what else to say. But i wonder if i would like this much if it was another actor instead of Jin-san. Maaa whteva they chose him for a reason! THAT'S FOR WATCHING NINJA ASSASIN WITHOUT ME! !